GEORGI GOSPODINOV (1968) is a poet, writer and playwright, one of the most translated Bulgarian authors after 1989. He has published four poetry books awarded with national literary prizes. His poems were included in many anthologies in translation, among which is New European Poets (Graywolf Press, USA, 2008). Gospodinov became internationally known by his Natural Novel. It has been published 7 times in Bulgaria and in 17 languages abroad, including English (Dalkey Archive, USA, 2005), German, French, Spanish, Italian, etc. The novel was praised by the New Yorker, NY Times, Village Voice, Guardian, etc. European critics called the novel a “machine for stories” (Le Courrier, Geneva) and the author – “a humorist of desperation” (Neue Zürcher Zeitung). And Other Stories (2001), his collection of short stories, came out in English (NU Press, USA, 2007), German, French, etc. Gospodinov’s short story is included in the anthology Best European Fiction 2010 (Dalkey Archive, USA). Gospodinov has written two theatre plays – D.J. (the initials of Don Juan; 2005) and The Apocalypse Comes at 6 p.m. (2010). The plays were awarded as the best Bulgarian dramatic text of the respective year. Both were staged in Sofia, D.J. also in Austria and France. Their radio versions were produced by the Bulgarian National Radio. 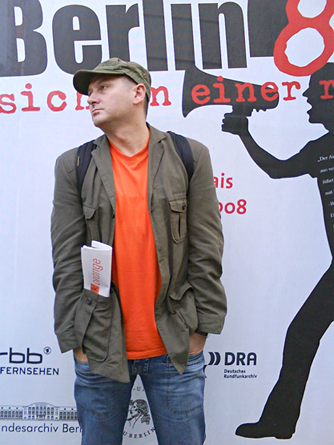 Gospodinov is author of screenplays for short feature films, the latest being Omelette (4.44’; Honorable Mention at the Sundance Film Festival 2009). His most recent project is the art graphic novel The Eternal Fly (2010, with the artist N. Toromanov).